Nokia Windows 8 tablet, an iPad killer ? In an interview with French newspaper Les Échos, Paul Amsellem, head of Nokia France, said that the company would have a tablet running Windows 8 in June 2012. And this announcement suddenly led to a lot of rumors. Immediately after this, Nokia’s official PR reported: “we have not announced any specific plans as it relates to tablets“. And we know this is gonna happen, given the wide opportunity that Windows 8 brings with it. A Nokia-Windows 8 tablet was very much in the tittle-tattle as we had reported long back ago. But after the advent of Windows 8, this just seems to be a huge six over the wicket. When Nokia and Microsoft had joined hands to revive their sagging products, many had taken to fore-telling about how this relationship wont last long. But here they are, having successfully delivered the Nokia Lumia 800, a masterpiece (acc to many). The Nokia Lumia 800 is considered to be the second most beautiful phone in the world and its capabilities are enough reason to dump an iPhone or Android device and switch over. With such results, their confidence mush be at an all-time high and the dream of Nokia being the numero-uno mobile company again may just be started seen as the truth. Bored of Apple: People are just bored of Apple. And their iPad. Plain truth. Windows 8: None has experienced Windows 8, a new OS, in its full version. Hence it carries a high excitement factor with it, after BUILD. Powerhouse (especially for touch) : At BUILD, Windows 8 on a touch screen tablet worked like magic. 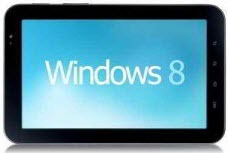 It was a beauty and that will be an important factor since Windows 8 is primarily for touch screens, is what I feel. The extra edge: Nokia is famous for going the extra mile and providing something unique to their customers, which is bound to happen in this case too. BANG! :If two giants come together, we get a bang: YEAH! Two giants like Microsoft and Nokia joining hands for a tablet can spell doom for other competitors in the market as we get the very BEST in technology et al. Come June 2012 or not, a Nokia-Windows 8 tablet is surely going to make waves. You said:”…The Nokia Lumia 800 is considered to be the second most beautiful phone in the world …”. So which holds the #1 position? Any survey done for this? And there are unconfirmed reports that Amamzon will introduce Windows Phone based Phones in future. lol, have you tried ipad? It was the first so had its time in the sun. now even the other tabs beat it hands down in features. ipad is just a name now. it sux! This article was a disappointment, line after line going through author’s personal choice being held sky high. the statement “Bored of Apple: People are just bored of Apple. And their iPad. Plain truth.”, is very unprofessional and biased. iPad sure is a good device, so are many other devices may it be android or windows phones. As readers we expect mature reviews, giving us an insight to the good and bad of the product on the articles highlight, rather than just trashing a “possibly rival” product. and yes, according to my personal chocie i prefer nokia lumia 800, as windows 7.5 is a bit refreshing concept to mobile OS.